Four more suspected mail explosives were discovered in New York City, Florida and California early Friday, one addressed to former Director of National Intelligence James Clapper, one to New Jersey Sen. Cory Booker, one to California Sen. Kamala Harris and one to businessman Tom Steyer. The four parcels seized Friday bring the total number of suspected mail bombs to 14 and they mostly bear the same unusual hallmark -- a lumpy manila envelope with six uncancelled stamps. But if they were sent through the mail, why weren't the stamps postmarked? 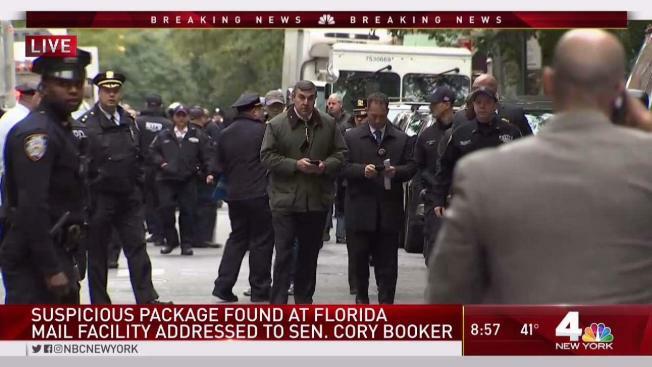 Four separate officials briefed on, or involved with, the investigation have told NBC this week that some packages were not postmarked because the soft packaging could not go through the postal machines. In fact, the U.S. Postal Service's own website says postmarks aren't required in all cases. "Postmarks are not required for mailings bearing a permit, meter, or precanceled stamp for postage, nor to pieces with an indicia applied by various postage evidencing systems," the USPS says on this page. None of the bombs have detonated, no injuries have been reported and authorities said Thursday it appeared some of the devices were flawed and incapable of exploding, though it wasn't clear if they were purposefully structured that way or it was just bad construction. Florida resident Cesar Sayoc is in custody in connection with the mail bombs.